Made from cast aluminum and have hand painted decorative appointments. Comes with heavy wall hanging hook on reverse side and wall mounting hardware. 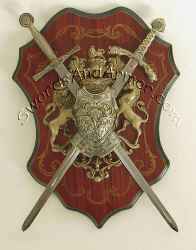 It consists of a large red shield with Rampant Lion theme in the center. The design has gold accents throughout. feathers, bird of prey and opposed poleaxes weaponry. Comes as Shown in the Sienna Metal Finish with artwork. 18" x 25 1/2"
Medieval Swords and Armor Bargain Dungeon !